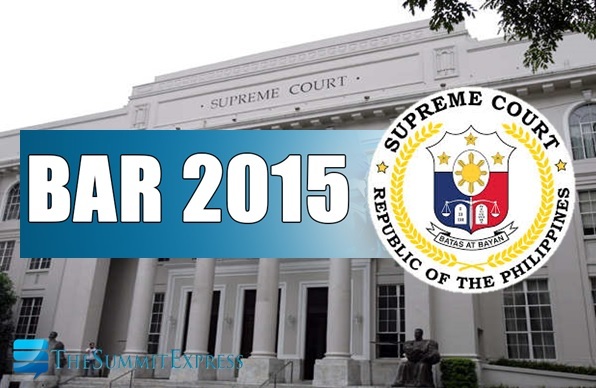 MANILA, Philippines - The Supreme Court (SC) is expected to release the results of the November 2015 Philippine bar exam on Tuesday, May 3, sources bared on Thursday, April 21. The SC is set to hold the special en banc session early May to discuss the passing percentage and the approval of results for the 2015 bar examination. The official list of successful bar examinees will be flashed on a widescreen at the Supreme Court front yard and simultaneously be viewed at the official website of the highest court. More than 6,600 out of 7,146 examinees have completed the four-Sunday examination held at the University of Santo Tomas that started November 4, 2015. Supreme Court Associate Justice Teresita Leonardo-De Castro, Bar exams committee head, announced that oathtaking of the new lawyers is scheduled on June 16, 2016 (Thursday). The 2015 Philippine Bar exams have 100% essay-type questions according to this guidelines. In 2014, bar passing percentage was 18.82 (1,126 out of 5,984) lower than the 2012 outcome. Irene Mae Alcobilla, graduate of San Beda College of Law Manila topped the exam with 85.50% average grade.